Let me begin this post by explaining that I am a long-term investor, not a trader. I am well aware that averaging down on a stock is not an optimal strategy for someone who is trend-following (duh) or following any technical analysis school of thought. Some people chastise me for “sending good money after bad” or not cutting my losses. However, I’m a firm believer that if you reasons for buying a stock haven’t changed after a sudden downward price move, you should either hang tight or buy more. With that being said, it’s been a wild week for me. I was buying up shares of Gap Inc stock (GPS) in January. The stock hit my radar because it was near four-year lows, about $23-24 per share, and offered a juicy near-4% dividend. I bought some shares and figured I would check back in a few weeks and possibly buy some more. I was shocked to check back in March and see the stock up over 20%. I really know how to pick them! The stock peaked at over $30, but since then has dropped back to the price at which I started buying. So I looked at GPS stock again – has anything changed? Do other investors see something I don’t see? 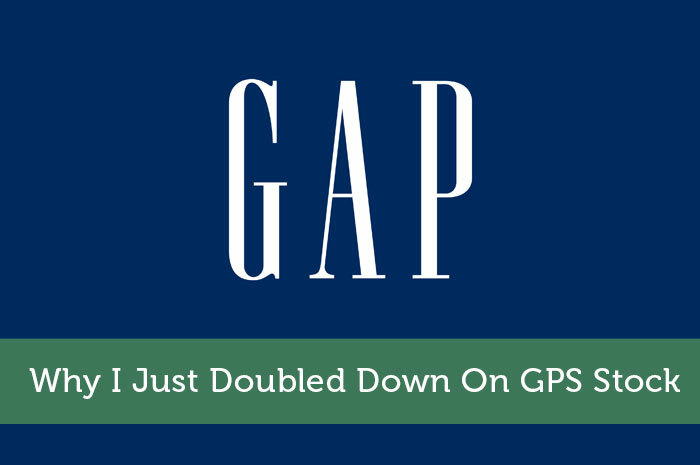 Gap has been doom and gloom for about a year now. Investors are losing faith and Old Navy’s president left in October to lead Ralph Lauren. Sales at Banana Republic were down 14% in March and sales at Old Navy were down 6%. The company is now feeling the pressure to perform, and pressure makes diamonds out of coal. The general public believes that Gap’s target younger demographic base wants nothing to do with the brand nowadays. I disagree. Every generation has the fashion-conscious and budget-conscious. Investors shouldn’t paint with such a broad brush, as concerns about younger shoppers leaving Gap in droves seem dramatic. Those who shop at H&M versus Old Navy or Banana Republic are completely different people. I like to buy at points of maximum pessimism. While I see article after article about Gap being downgraded or suffering bad news, I scrutinize it even harder. Of course, I don’t just go with my gut or buy what I like – I have to look at the numbers. Gap has an operating margin of over 10% and a net margin of over 6%, well above its retail peers. If Gap really wanted to, they could advertise even more aggressive sales to spur revenue and try to capture (or recapture, I guess) some brand loyalty supposedly lost on the younger generation. The P/E is sitting around 10 and the dividend yield is now close to 4%. Numbers like these should encourage investors to at least give the stock a peek. The dividend has grown 22.50% over the past three years. They’ve been paying dividends since 1976 and have raised their dividend for 11 consecutive years. If the price decreases, I’ll buy some more. I looked at Gap’s insider buys/sells and found that from March 2013 to March 2015, when the stock was peaking, insiders were selling left and right. In that two-year time frame, there wasn’t a single insider buy. Not one. However, as the stock started declining, insiders have made some purchases. John, William, and Robert Fisher, directors/owners, bought over $13,000,000 worth of stock in August. In November, Arthur Peck, CEO, bought 37,150 shares at a trade price of $26.99. Seeing some insiders finally buy some Gap stock makes me feel better. I’ll have to keep my eyes and ears open. Hopefully I’m not catching a falling knife! Disclosure: I am currently long GPS stock.